Manager Adam Murray thanks the fans. 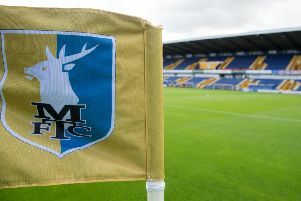 Mansfield Town boss Adam Murray explained the thinking behind his recorded pre-match speech to rouse the troops and get fans behind his side for last weekend’s visit of Stevenage. Murray’s voice came over the tannoy just before kick-off, calling on fans to stick together and show the resilience and solidarity the town has a reputation for. It certainly seemed to work as the fans largely stuck with their side and Stags won 2-1, but Murray said he didn’t see it as a rallying call and just wanted to remind people who they were as a town. “It wasn’t a rallying call but more a perspective of who we are as people,” he said. “The Mansfield community have intrigued me for many years. I think they have so many qualities that sometimes they forget what those qualities are. “Sometimes it becomes one of those environments where we end up getting that confused who we are that we beat each other up. “The strength of the town has always been itself and when the going has got tough over the years they’ve stood together. “You look at the mining days, like I said on Saturday, when they stood together in protest. He continued: “All people have done over the last couple of years is said Mansfield Town are a bang average team and the way they play is ugly. “We’ve had a lot of bad press and on Saturday, I though everyone in the ground needed to hear from me that it was time to stick together. “You have done it for years as a community. You are that stubborn in your pride and your ability not to lie down, bring it to the stadium. “Win, lose or draw, stick by these boys as I can guarantee you there’s not one player in my squad that will have a bad game on purpose. “There’s not one player in my squad that won’t go out there and give his everything. “If he is having a bad game, he’s having a bad game. We are in League Two – that happens. But they will be giving everything.